Elevate your Lackawaxen getaway at this peaceful mountain retreat nestled in the Greenbelt. This 3-bedroom, 1.5 bath cabin sleeps 7 and has all the comforts of home with resort-like luxuries. The Masthope Mountain Community has access to Big Bear Ski mountain, an outdoor pool, horse stables, fitness center, lake, beach, clubhouse, and more! After active days, you'll love lounging in the Zen Garden or cozying up around the outdoor fire pit. This mountain manor is highlighted by vaulted ceilings, rustic wood beams, cozy cabin decor, a wood-burning fireplace, and comfortable furnishings. Make yourself at home on the plush living room sofas and turn on the flat-screen cable TV, equipped with Roku and a Wii game console. After long days on the slopes, replenish your famished group with hearty meal prepared in the well-equipped kitchen. Everyone will have a place to settle down for breakfast, lunch, and dinner at the dining room table or breakfast bar. Outside, the private outdoor oasis boasts a double deck zen garden, Shangri la trails, fire pit area, patio furniture, hammocks, walking trails, tiki bar, and beautifully manicured gardens. Barbecue out on the deck before gathering around the fire pit to roasts some s’mores for dessert - all while admiring the stunning forest vistas. When it's time to retire from the day, retreat to one of the 3 open and airy bedrooms, all with cable TV, cloud-like beds, and a thermostat for optimal relaxation. When the snow melts, you'll be gifted to the resort's Olympic-sized pool, kiddie pool, water slides, tennis courts, mini golf, basketball courts, and private lake with a white sandy beach. Paddle along the scenic shoreline on the kayak, paddle board, or canoes available for your use or walk over to the Delaware River for white-water adventures. Your equine dreams will come true at the stables located inside the community! Hop on one of the horses for beautiful trail rides through the Pennsylvania scenery. When you're not taking advantage of all this resort has to offer, hit the links at Woodloch Spa and Golf Course just 10 minutes away! Visit Bushkill Falls to see the 100-foot waterfall or to hike and fish in this stunning park! - Amenities include a well-equipped kitchen, free WiFi, 2 flat-screen cable TVs, Roku, Wii game console, wood-burning fireplace, furnished double deck, zen garden, hammocks, fire pit, gas grill, bar, and more! - Access to Masthope Mountain Community amenities (included with registration fee) including outdoor olympic-sized pool, kiddie pool, water slide, tennis courts, mini golf, lake with white-sand beach, kayaks, paddle boards, canoes, fitness center, cross country ski trails, horse stables, access to Delaware River and more! 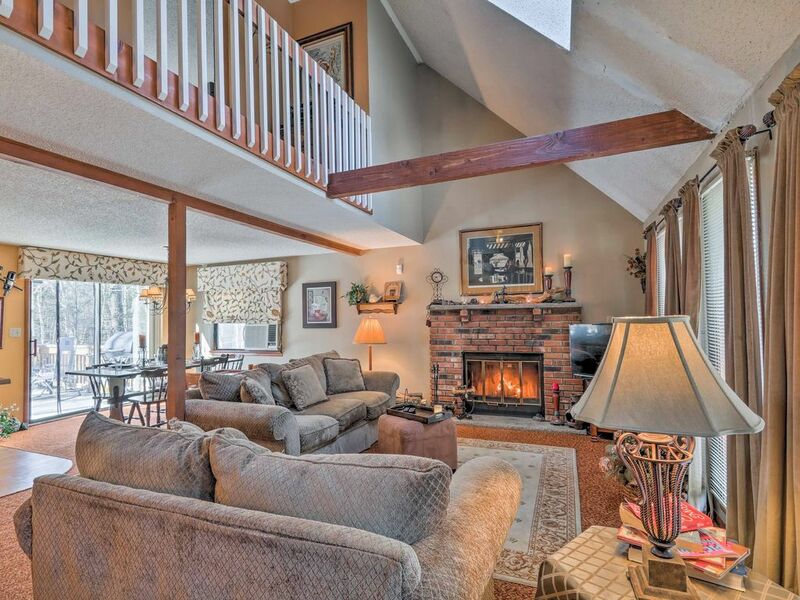 - Great Lackawaxen location down the road from Woodloch Spa and Golf Course and Buskill Falls! We decided to book Jeff and Faith's home rather spontaneously with only giving them 2-3 days notice. They were more than happy to accommodate our request. When we arrived it was everything we expected and we couldn't be more happy with our decision to visit. When we pulled into the driveway we were greeted by deer which totally put us in awe. Upon venturing out into town we located a covered bridge and lots of other beautiful scenery. The highlight of our trip, however, was actually being able to have a deer, which Jeff and Faith call Bella, actually eat from our hands. It was truly an amazing experience. On top of Jeff and Faith being so accommodating to us, they were also warm and friendly while dealing with them. They are truly wonderful people. I highly recommend their home especially if you love nature and the beauties of it. We plan on returning ourselves in the near future. A huge thank you to Jeff and Faith for their hospitality and their kindness in sharing their beautiful home. We had a great time at jeffs cabin ! We had a very nice stay at Jeffs cabin....its a nice cozy place.The house was well equipped and we cooked on Jeffs grill every evening .The backyard is very nicely done and looks great at night too! .The deer were entertaining all day long and we were able to feed some by hand..the rooms were as advertised but no ac in upstairs master bedroom..The community is very nice and safe feeling ,,,security are very noticeable throughout. The pool was very nice and most the staff were friendly...we ate apps at the bar which were very good..I recommend you pick up your activity badges on your way in as the office closes at 4 P.M. since check in is at 3.There was also a 50 dollar fee added for community use once we were in contact with the owner. We attended a concert at Bethel Woods which was around a 45 minute drive and a terrific place to see a show..There is a river at the entrance to the community which is very beautiful...Also Jeff was quick to return our calls when needed..
Great house, beautiful back yard, my teenagers even loved it:) We loved the deer and even saw a black bear, the house had everything we needed, we would go back!